Are You Ready for April 21st and Mobilegeddon? Upgrade Your Hypnotherapy Website Now. If you were not aware April the 21st this year is incredibly important for Hypnotherapy websites and their owners. On this date Google is going to change its algorithm and penalise sites that are not mobile responsive. This change has been brewing for the last year or so especially in light that well over 50% of searches on its site are now completed on mobile devices. The speed at which search engine views have changed is quite astounding and has probably caught a number of website owners on the hop. Google always looks to give their customers what they want and in order to maintain its position as the number one search engine in the world it is reacting to change incredibly swiftly. So what does that mean for you. Well if you have updated your hypnotherapy websites recently you should be fine but just in case double check especially if your work was done by a web developer. If you have an old website that has not been touched for a couple of years then you need to move fast. This update is potentially going to be brutal. So if you were happily on the first page of Google gaining business each week you may suddenly find yourself plummeting down the rankings to somewhere you will no longer be found. That means that potentially your business could be ruined overnight. Think I am exaggerating? Have a look and see what some of the other algorithm changes did to companies particularly the ones that Google made under the code words Panda and Penguin. Many businesses went under or were close to losing all their trade because they were not compliant with what Google wanted. It is no joke going from a business that potentially has calls and interest from clients every day to having nothing at all. Unless you have a business that is referral only you could have big problems. If you are not sure whether your site makes the grade then there are two ways in which you can check what you have up and running. 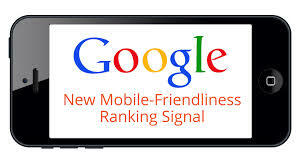 Firstly there is the Google mobile friendly test. Simply plug in your hypnotherapy websites details and see how your site performs. Alternatively you can go into Google Webmaster tools and use the mobile usability report to see how you perform. If everything is fine sit back and relax however if you have a problem then you have just under a month to get everything resolved in the system. Good luck. ← Why Saying No Is Essential To Your Hypnosis Marketing Success!